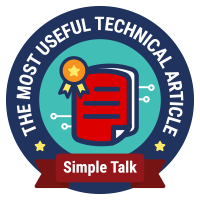 This fourth blog post in my series on on Continuous Delivery with TFS / VSTS picks up from the previous post where we created some common infrastructure and moves on to installing a domain controller. If that seems a little over-the-top bear in mind that one of the aims of this series of blog posts is to help organisations with a traditional on premises TFS installation implement continuous delivery. Typically a domain controller running Active Directory is going to be part of the mix. New-AzureRmResourceGroup -Name "PRM-CORE" -Location "West Europe"
My plan to create the domain controller in PowerShell came to an abrupt halt when the code bombed with an error that I couldn't fix. When I first started writing this post there was a bug in the new-style Azure PowerShell cmdlets that stops a VM from being created where the storage account already exists in a different group from the one the VM will be created in. With a newer version of the cmdlets this has now changed to a warning: WARNING: Storage account, prmstorageaccount, is not found. The OS disk may be in a different storage group. As far as I can tell, despite the message VMs are now created correctly. Anyway, all this was too late for me as I had already created the VM (called PRM-CORE-DC) via the portal. If you go down this route do make sure you set the DNS name label of the public IP address to the name of the VM. (See my post here for more details about why you should do this.) Other than that gotcha creating a VM in the portal is pretty straightforward but don't forget to specify the already-created premium storage account (if you have decided to go down the premium route as I have), virtual network and the resource group created above. I created my DM as a Standard DS2 (since I'm planning for it to be doing quite a lot of work) running Windows 2012 R2 Datacenter. Previously my DC would be configured as a Standard A0 and I would leave it turned on (which costs pennies per day) but the DS2 burns through credits much faster so I'll be turning it off. This will all be scripted so the DC can be shut down last (and started up first) and I'll also be showing how to automate this in case a lapse of memory leaves your VMs turned on. The second thing to know about setting up a domain controller in Azure is that if the AD DS database, logs, and SYSVOL are not stored on a non-OS disk there is a risk of loosing data. For a lightly used POC environment I'm happy to take the risk but if you are not you'll need to add a data disk to your VM and specify this as the location for the AD DS database, logs, and SYSVOL during the installation of the AD role. 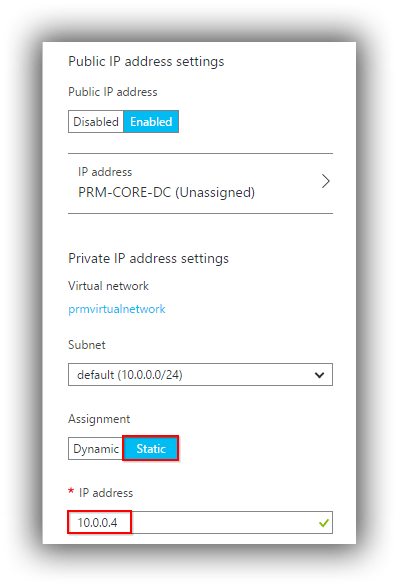 Before installing AD in Azure you need to temporarily set the virtual network to a Custom DNS of 127.0.0.1 for the Primary DNS server setting. See this post for more details. It's crucial to do this before you start installing AD. Install the Active Directory Domain Services role via Server Manager > Add roles and features. The wizard steps are mostly straightforward but if you are unfamiliar with the process it may not be obvious that since we are starting from scratch you need to select Add a new forest on the Deployment Configuration step of the wizard. You'll also need to specify a Root domain name. I chose prm.local. With your VM restarted make sure you complete the Reset the DNS server for the Azure virtual network instructions in the documentation. Essentially this is replacing the temporary 127.0.0.1 primary DNS server setting with the one for the DC, ie 10.0.0.4. With AD up-and-running you'll probably want to navigate to Server Manager > Tools > Active Directory Users and Computers and create a user which you'll use to log on to servers when they have been added to the domain. It's not a best practice but you might find it useful if this user was in the Domain Admins group. That's it for this time. Use your Domain Admin powers wisely! 12/12/2015 -- Replaced adding a DNS forwarder pointing to Google's DNS server with setting the virtual network's Secondary DNS Server to 168.63.129.16 to allow access to the Internet. 2/1/2016 -- Updated to reflect my adoption of premium storage and also to remove the change above and replace with a crucial technique for ensuring that the DNS roots hint list on the DC is populated correctly.